We Are Buzzing - Find out what our clients say about us? We have been working on our social media and website development with Local Buzz Marketing for some time now with great results. Previously we managed this in-house but soon felt out of our depth. Jon and Neil understood our brief and goal and with the allocated budget have made the goal achievable and beyond. We have also run some mini-campaigns with great success. I like the flexibility that Local Buzz Marketing offer and the speed to which changes can be made. I would have no hesitation in recommending Jon and Neil at Buzz. We have been with Local Buzz since their conception, had so much support from them and have pushed their services to as many clients as we can. They are pragmatic, supportive, proactive and always make us feel like we are their only customer. These traits are so rare these days which is why we will continue to work with Local Buzz going forward. A massive thank you from Ridgeway Training! Since moving our digital presence across to Local Buzz Marketing, our business is now starting to really have a presence online. After going through two previous companies, it was refreshing to come across a team of people of would go the extra mile to ensure our website and many other digital assets were geared to make the business grow at a controlled rate. The team are on hand at all times and will help in any way they can, even if it is outside their remit. I cannot recommend them highly enough, simply the best digital company out there. Local Buzz Marketing have a refreshing approach to achieving your marketing goals. Their friendly and approachable style blended with their enthusiastic “buzz” ensures you achieve an outcome which is truly bespoke and certainly NOT “off the shelf! By combining their knowledge of both local and national market opportunities, they are ideally placed to build a relationship that truly works in harmony with your business. Local Buzz take care of our online marketing, including social media, video marketing and website content. When it comes to online marketing, Buzz are two years ahead of the game in terms of what they know about all aspects of internet marketing. If your website needs more traffic & leads then you need to start talking to Local Buzz Marketing. Local Buzz have marketing ideas that nobody else is thinking of. They're creative beyond expectation, always thinking outside the box which gets us noticed in ways we could never have imagined. Buzz are incredibly easy to work with and genuinely understand our business. We recently appointed Local Buzz Marketing as our online marketing partners. The results to date have been outstanding; we now appear on search engines such as Google, for keywords relating to our services, which is driving more relative traffic to our website. Buzz also runs our social media campaigns and help us to keep up to date with the ever-changing digital world. We are very grateful to Jon and his team for all of their efforts, always reliable and professional. I had no idea what to expect from this course, but Local Buzz Marketing are brilliant at finding out about your business, and then showing you how to use social media in an appropriate way. There was a lot of laughter and as someone who is not normally at ease with social media, I learned a huge amount. I would recommend Buzz to anyone who is serious about using social media to lift their business to the next level. Having identified a need to step up our Social Media marketing, we decided to speak to Local Buzz Marketing who had been recommended to us by another company. Buzz came to our office to discuss our requirements and made some suggestions as to how he could help us moving forward. Initially, Buzz took over our Facebook and Twitter marketing and then our blog writing. They also organised a competition for our customers to provide some engagement with them and to build on our Facebook likes. We found Buzz very easy going, but at the same time extremely passionate and eager to understand our business fully so that they could produce positive results with our Social Media campaigns. As we needed a full time in-house Social Media Marketer for all of our businesses, Buzz were happy to provide some additional one to one training to enable a member of our team to take on the Social Media role moving forward and they also provided a course for other members of our team on Social Media and Google Adwords. We would have no hesitation in recommending Local Buzz Marketing and are sure we will continue to use their services in the future. 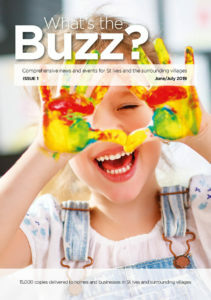 Local Buzz Marketing began managing our social media and website content for 360coms two years ago. They have since gone on to become our marketing partner for the entire 360group.